Why is the band Questionable Goods from the TV show Girls without a website? Those of you who have been watching HBO’s show Girls probably know that Marnie’s ex-boyfriend Charlie has a band called Questionable Goods. It was first mentioned in the fourth episode when they played a song with the lyrics from Hannah’s diary. It turns out that the website doesn’t exist. Even more, WHOIS results for the domain questionablegoods.tv show us that it was registered on 27th May 2012, on the day when seventh episode premiered on HBO. The name of the person/company who registered the domain is hidden. Unfortunately that’s not the first time HBO screwed up with Girls when it comes to social media. 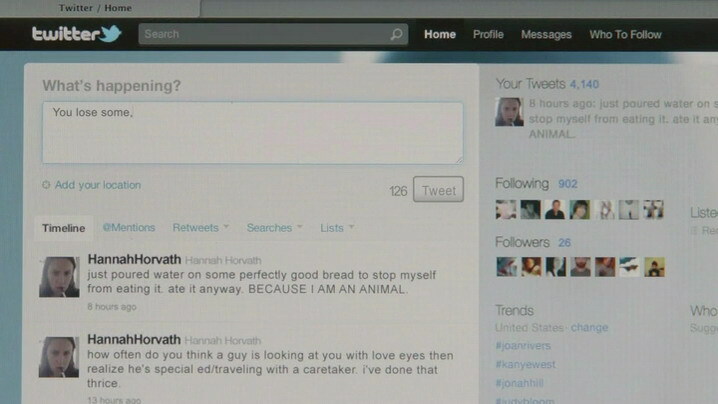 In the third episode we saw Hannah tweeting from her account @HannahHorvath. The account was set up on 16th April 2011, but as of today it hasn’t posted any tweet, it has no friends, but on the other hand it has 699 followers. The screenshot below is from the third episode, but unfortunately it only exist in the TV show. Come on HBO, Girls is a great show and you can do better with those small details. I really enjoyed the song that the band was playing at the big warehouse party in episode 7. Is it a real song that I can download somewhere? OK so if the site was registered the day the show airs then it is a good chance HBO is not the owner. People claim URL, s in the hope that people will pay to own them. You’re right, but HBO could (and should) registered the domain before the episode premiered on HBO. It would’ve cost them only a few bucks, but they could’ve used the whole Questionable Goods part of the show much more efficiently/creatively. SMS headphones at Chelsea parade – great fit or forced exposure? Can this elephant T-shirt become a cult item?